If you’re in the market to buy or sell, there’s no need to wait for the spring. Read on to discover the top five reasons that it can pay to buy or sell a home during the off-season. Home renovations and repairs can also be less expensive in the off-season. 5 Whether you’re fixing up your property prior to listing it or remodeling your new home before moving in, contractors and service providers who are hungry for business are often willing to work for a discount this time of year. If you wait until the spring and summer, you may be forced to pay a premium. Good curb appeal is crucial when selling your home. According to a recent report by the National Association of Realtors, 44 percent of home buyers drove by a property after viewing it online but did NOT go inside for a walk through. 6 That means if your curb appeal is lacking, buyers may never make it through the door. Now that you know all the great reasons to buy or sell a home in the off-season, it’s time to decide whether you’re ready to make your move. Every client’s circumstances are unique. 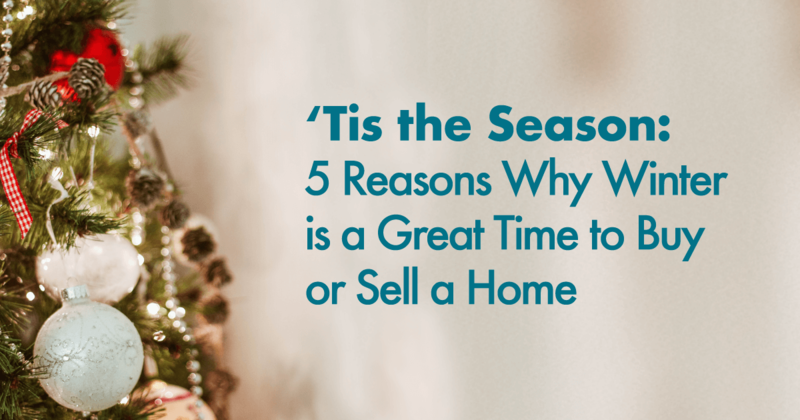 Whether you need to move quickly or you simply want to take advantages of all benefits this season has to offer, it’s a great time to enter the market. Give us a call today to schedule a FREE consultation … and you could be ringing in the New Year in your new home!